9.1c improves split window displays. Vernon D. Buerg’s excellent LIST program – version 9.1c. for personal use only subject to the restrictions set forth in the last chapter. license. See the last page for information about licensing. aid of scrolling, positioning and filtering commands. new file management commands are used. and define certain terms like: redirection, piping, and filtering. to be exactly the way YOU want it to be. use LIST from anywhere on your system. renaming the program to L.COM in the process. then press Ctrl-P (the Ctrl and P keys at the same time). SELECTION MENU FOUND LATER ON IN THIS MANUAL. - the Help screen is minimal. There is also a commercial version of LIST called LIST Enhanced. - file tagging, including tag all, untag, retag, etc. from Buerg Software. Registered users of LIST receive a $20 discount. ">" and then the name of the desired device. For example. "output" of the DIR command was "redirected" to the file, FILE.LST. The ">" symbol stands for redirection of output to another device. would sort the file in alphabetical order. "filters" built right into it and we'll discuss these later on. filter. FIND would be searching each line for the string "-88". would be displayed on the screen! You can use more than one "pipe"
pipe it through the FIND filter, looking for files created in 1988.
and piping, we will go on to discuss the command line of LIST. filespec, or present you with a file selection menu. LIST MYFILE.TXT /W which would set Word Wrap ON. example, /-W or /W- will set wrap off. reverses the default, or cloned, setting. display of ALL files and subdirectories in the current directory. directory entry and press ENTER to change to that subdirectory. called XYZ, and then LIST can be instructed to read that file. To see a piped file, omit the filename, but supply the /S. the data is displayed, and many other operations. The ESCape key also returns you to DOS without changing the screen. to exit file selection menu. prompt is on the top line of the screen. DOS and displays the screen that you had before LIST was run. When you press keys, they are entered into a keyboard buffer. Holding down a key can put many copies of that key into the buffer. the buffer may not yet be empty and LIST will continue to page down. DOS normally sends when you cancel an input line. Operation with DOSKEY, 4DOS and NDOS is not special. values. LIST does not preserve fonts or palettes. primary display window, and are usually lines two through 24.
date. It is the date and time that the file was created. case means the option is ON. down arrow key to move the display one line in the file, i.e. display the next line in the file. approximately 50 lines per minute to 1000 lines per minute. not represent the actual number of lines in the file. line will be displayed as 5 lines. with that line number at the top of the screen. (status) line, plus or minus the number of lines that you specified. the file may be repositioned at the top. the options in effect. LIST is fastest with no filter options set. and line feed characters, and expands TAB characters. makes these files easier to read. characters, and may be displayed if the '8' command is in effect. toggles ON or OFF the wrapping of lines longer than 80 characters. functions are disabled when Wrap is ON. command), the filter strips the high order bit from each character. graphic characters above ASCII-127, are displayed. ASCII-26 are replaced by blanks. backspacing to emphasize, or over-write, characters. can be displayed in Hex is 4 million bytes. lengths, the hex display may begin before the current record. command can be used to change the tab interval from 1 to 99. Scan (/ or S) command. Use this command to search an exact match. That is, the search is case-sensitive. always matches. LIST uses the question mark (?) as this character. ampersand (&) as the escape character. match lower case file text. not found' on the bottom line. setting of the "Find Row" (see Configuration section). Text not found ***', and the rest of the display remains unchanged. the previous occurrence, press the F9 key. | searching with the 8 filter is faster than the 7 or star (*) filters. o with the Alt-D (dump data) and Alt-O commands. commands, or a line found by the Find or Scan commands. extracted). The marked lines are displayed in reverse video. found by the Find or Scan commands. contracts the range - and Alt-B moves the bottom mark. the found line to the file. will receive an error message, and nothing will be printed. arrow will display and print the next line of the file. line while printing if the bottom line is set to show TOGGLES. The Ctrl-P command prints the file in its entirety. LISTOPT customization program supplied with registration. The Alt-P command prints only lines that have been marked. will display all files with an extension of DOC and TXT. to look when LIST ends. at one time. The line number for each file is remembered. Ctrl-PgUp commands to move among them. The Alt-V command displays a list of file in the current directory. enter to add that file to the list. windows. The Alt-W command toggles this split screen mode. dialing commands to your modem on COM1. the number again, or ESCape to hang up and stop dialing. The Ctrl-H command hangs up the telephone. other windows, or on networks. exclusive access by other processes. another process, you will receive the error message "File not found"
command to return to LIST. disabled, LIST requires less memory, about 66K. original screen by exiting LIST with the Alt-X command. enabling and disabling the screen saving feature. which defaults to disabling screen saving. | option in the LISTOPT customization program. selection bar is controlled by the Alt-F7 and Alt-F8 keys. the cursor to the filename LIST.COM, press shift-L.
move around your hard disk from within LIST! to the SHOWDOTS parameter in th netware manual for more information. may escape back to the original screen, with all of its options. Alt-W, you can load more than two files. subdirectory. Highlight the file you want to copy and press ENTER. copied to the directory you indicated. then be prompted to make sure that you want to delete this file. Enter Y if you do, and N if you do not. 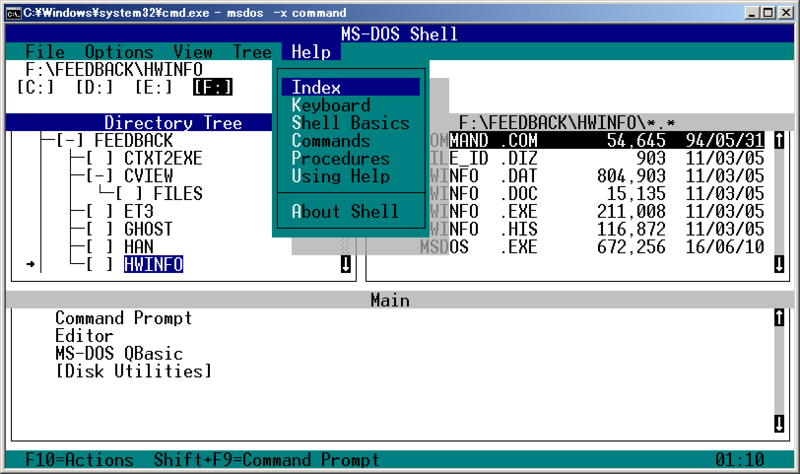 The default under MS DOS 5 and 6 is the DOS EDIT command. by the executed program. The I command is not listed on the menu. options or the Invoke function will terminate. Move any file in the current directory to any other directory. and the file is moved to it's new location. to another drive and/or directory. is hidden, and 'h' means the file is not hidden. command to display a file within the archive file. | If the LIST DOS variable is not defined, the TEMP variable is used. ZIP files, the program PKUNZIP must be in your PATH. way, indicates what the command does. H Display the Help screen. P Toggles the printing of displayed lines. Z Display the previous file. may have any name and may reside in any subdirectory. other windows that you may create. program COM file by using the Alt-C cloning function. and on the current drive and in the current directory. LISTS.COM, is a slightly smaller file that excludes the Help screen. accessible (because of an APPEND type of utility). alternative to cloning is to use DEBUG to make permanent changes. Special lines 1 and 25 colors, default is 70 (reverse). attribute values for the colors that you want. Shared and Retrace, specify a hex value of the sum, or 01+04= 05.
location 13C which is normally '08', i.e. one less than the row. of keys, such as F1, Alt-X, Ctrl-A, and the cursor positioning keys. identification of a routine that performs a function. "Done". The "Done" routine exits to DOS. lower case letter q, so be sure to change both entries. location (387 hex) from a 10 hex to a 0F hex. Use ARCE to extract files from an ARC archive file. The program name may be either ARCE or ARC-E.
drive and path name is used. The filename must be supplied. The extension defaults to ARC. filename may contain the * and ? wildcard characters. If no filespecs are supplied, all files are extracted. drive designator and/or path name. key to over-write the file. Use the /Q option to suppress alarm sounds, beeps, and bells. password as was used to create the file, e.g. /GSECRET. for files created with the ARC /Z subdirectory option. next archive member is processed. is left on the disk for your examination. skip this member and continue to the next. the output disk. The program terminates. The archive file data is invalid. The program terminates. archive file. The program terminates. bytes, or there are bytes missing. The archive is invalid. o The line number is currently limited to 16 million. files are available to licensed and registered users. o The review limit is 32 files for the regular and Plus versions. The bookmark limit is 10 entries. later is required for file sharing. o An OS/2 v1.2 version is available to licensed and registered users. o ANSI.SYS is NOT required. copyrighted, trademarked, and all that. payable in U.S. dollars to Vernon D. Buerg. Canadian and non-U.S.
checks require excessive bank charges. users will receive a free upgrade to the future MS Windows version of LIST. may NOT be copied or distributed. See the file PROGRAMS for details. 10 am to 5 pm Pacific time, Monday through Friday. upon request. Purchase orders and invoicing are acceptable. use the software. By using the software, you agree to this.